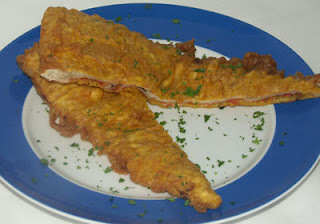 In a never ending quest for strange and extreme--but still edible--foods I found this, um, treat: deep fried pizza! Apparently this is quite the rage in Scotland, last bastion of the die hard fryer, and has since been imported to these United States by Scottish emigres hankering for a taste of home. This particular variation is a slice of pepperoni, topped with a hand full of field greens, battered and fried. Tasty, no? I swear the next one won't be pizza related.